This is from another supermaket in Mexico City. As you may remember, I wrote that there are very few cheese stores in Mexico city and the places with the largest selection are supermarket chains. This one is called City Market and it is definitely upscale, with their fine food prepared food menu, brick oven pizza shop, gelato counter (not helado), and a pinxtos bar (not tapas, they use the Portuguese word to add to the snobbery). However, it is the only place around me that has organic eggs, soy and rice milk, and decent coffee selection from Chiapas. Their cheese counters have flags from the countries they say they bring the cheese from, but it is all a mediocre selection of pre-processed - pre-cut cheese. They did have a Foume d'Ambert that looked ok, but was completely unwrapped and exposed making sure that this very expensive cheese will be dry and old in a couple of days. The only interesting offering was an artisanal quesillo, which promise to be good from the huge "enredado" in the case. The brand is La Huastequi and it said it is artisanal. I bought a piece and will be tasting it soon, at the counter it tasted good if a little dry. I also got a small Queso de Petate (another name for farmer's cheese) from Oaxaca made according to the label in an artisanal way with no preservatives by a company called Xipe. These trucks are everywhere in Mexico city every Wednesday and Thursday, when these families come from Oaxaca to sell their products in the city. The quality is good, clean and the prices average. We buy from them Queso de Canasto and sometimes Quesillo. The only problem is that we don't know about the production methods back in the farm. If you are in the city, stop by one of them and try their cheeses, buy a little piece of quesillo, a tlayuda, some chapulines (grasshoppers) and ajos salados (tosted garlic with chilly and salt) to make a salsa for your very Oaxacan quesadillas or Tlayuda as they call it. Their selection includes: Queso Oaxaca (quesillo), Panela (a feta-like cow's cheese), Menonite, Canasto (farmer's cheese), and Requeson (ricotta-like), Chiapas (Doble Crema de Cuadro), Cotija, Chihuahua (cheddar-type). The original idea was to give people some guidelines on how to go about buying cheese for their wedding, but then I thought to myself, I will not take someone else's rules. This is my event and only the two people getting married know what the entire event should be like. But before I turn into Groomzilla, here are my menus and a small explanation of why I choose the cheeses in the boards and dishes. One of the first events we had on our way to getting married was a good-bye picnic in Prospect Park, Brooklyn where a lot of our friends from New York came. The day turned out to be a gorgeous sunny, warm and aromatic day. I love the smell of Prospect Park; the air from the marshes there along with the briefs swifts of ocean air, make the place a perfect spot to clean out your lungs from the city traffic. 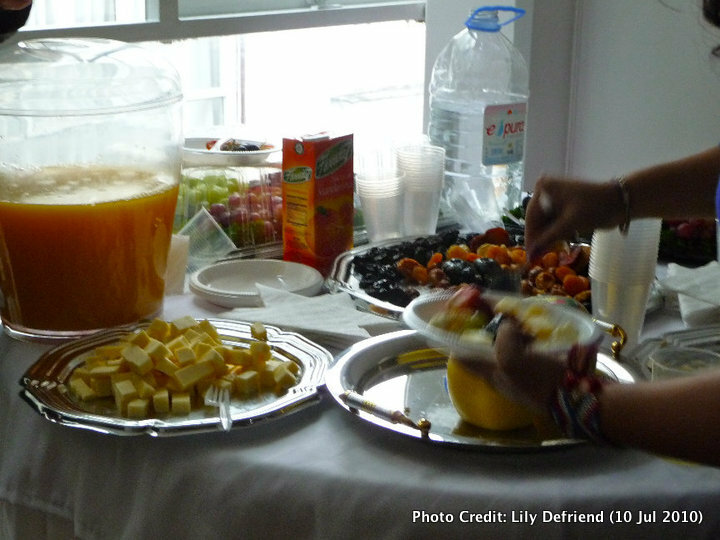 For this event, we asked friends to bring food potluck style and everyone outdid themselves. From small sandwiches, to spring rolls and awesome endive salad with a fatty pecorino. Everything was delicious. I got the cheese for the picnic at Lucy's Whey at the Chelsea Market, at Murray's Cheese in Greenwich Village and at Formaggio's and Saxelby at the Essex Market. My idea for the cheese was to have a fresh board, nothing heavy that will be difficult to eat with the heat of the day and also nothing with a rind that would start turning crusty and old after being out of the fridge and in the sun for a while. Because the picnic was also part of the wedding celebration, I wanted something romantic and have to admit that looked everywhere for Coeur de Neufchatel, but nobody in the city seems to carry it. The other cheese that I bought but didn't make it to the board as my husband and I ate all the night before the picnic was Moses Sleeper from Jasper Hill Farms. This was available only at Saxelby and it was so perfect runny and creamy that needed to be eaten right away. All the cheeses worked well together and people got to taste them with food, which is great. We had a couple of baguettes on hand and tons of other food to munch on. My personal favorite that day was Cremont and Will's was Mountaineer. Langres is a huge crowd pleaser and it is too bad that Murray's no longer washes them in-house before putting them in the shelves. Back when I was in the caves, we brushed them every other day and they turned even more funky after being with other washed rinds. If I ever start an affinage room in my house I will definitely try to wash my Langres too. In a non-wedding note, the day of the picnic was also the day of the first cheesemongers invitational organized in NYC. I was at the event and got to see so many friends and people in the cheese world. It was truly a unique experience. The second event involving cheese to celebrate our marriage was a cheese tasting for our friends and family in Mexico City. Since Will and I are not religious, we wanted to do various events where our loved ones will share in the experiences that make us individuals but also a couple. Will choose to have a private showing of the Polyforum Siqueiros light and sound show for everyone and I organized a tasting of Mexican cheeses. Here that challenge was even greater, but with the help of cheesemakers, cheesemongers and my mom, all the cheese arrived on time and was ready to be tasted by everyone a day before the wedding. I choose four Mexican cheeses, from three different regions of the country. The reason was that I believe that these cheeses represented our culinary culture and a distinct terroir. The two first ones are made in Chiapas with cows’ milk, if you check back in some of my older posts you will find a description of them. The third one is made in the North of Mexico by a Mennonite minority. The ones that I got were not on top of their game, but you could taste the terroir of the Northern pastures with a more fat flavor and perfect coloring. The last one is made by a great couple who just started making cheese a couple of years ago. 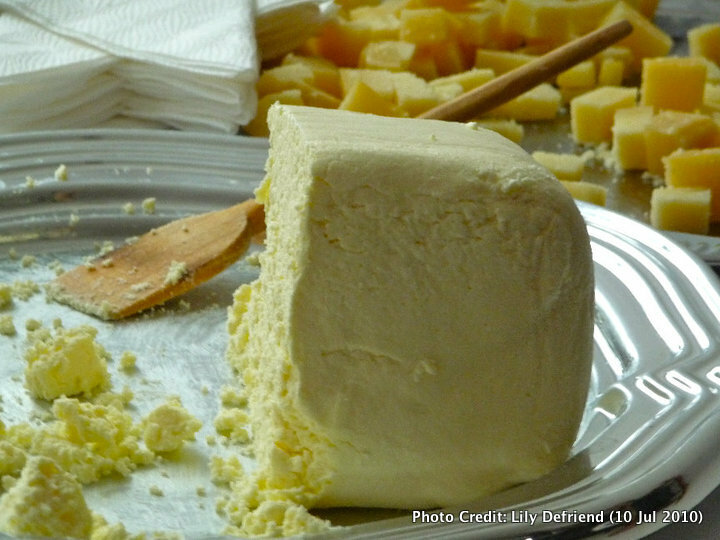 They established themselves in Queretaro, which is becoming a Mecca for cheese and wine. This particular cheese is excellent when is slightly mature, you can find information about them at Quesos de Oveja. I paired these cheeses with grapes from Hidalgo, Pitahaya from the coast, caramelized figs from the middle part of the country, freshly squeezed orange juice and Bola De Oro coffee. I gave a little presentation about cheese tasting and invited future members of the board of the Mexican Cheese Society. It was such a fun thing to do. I wished I had been able to bring Queso de Poro de Balancan and real Cotija and Quesillo de Oaxaca, but synchronized logistics in Mexico are still our Achilles heel and you cannot completely depend on people sending the cheese on time. The last event was the wedding itself, and the banquet afterwards. We choose a restaurant call Saks in San Angel, mostly because they are one of the few restaurant in Mexico that serve organic and local produce and meat. There were two different cheeses in the menu at the banquet, not as main dishes but rather as part of another dish. The first was Requeson, which is not really a cheese; it is like Ricotta a second cooking of leftover whey. This was served on blue corn tortillas to make an amazing quesadilla. The other cheese was a manchego style cheese (read my entry on Mexican manchego style cheeses to understand what is this cheese) melted with mushrooms, squash blossoms and spinach, inside a phyllo pie dripped with poblano cream. This last one was our vegetarian option and for the meat eaters we had local ribs of lamb encrusted with herbs. The menu was a total success with everyone feeling super full and happy. For me and Will this was the best present, to have everyone that loves us with us that day eating, experiencing and enjoying all the things we love. Cheese!